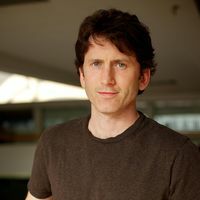 Todd Howard is currently the executive producer of Bethesda Softworks, a position he has been credited with since the release of Bloodmoon. His work on the Elder Scrolls series started with the CD release of Arena. Since then he worked his way up the ladder at Bethesda from designer to Project Leader, and finally to Executive Producer. Howard is also the executive producer of the Fallout series. His impact on the development becomes clear if one looks below the surface. Howard was heavily involved in preliminary game testing, as is apparent in the cells named after him (i.e "ToddTest") in both Morrowind and Oblivion. He also provided voice acting for testing purposes in Oblivion. Outside of the video game world, Howard is known to be a fan of Notre Dame.